The frenetic buy/sell pace of financial markets is being experienced in Ramapo College’s Global Financial Markets Trading Laboratory in the Anisfield School of Business. The Global Financial Markets Trading Laboratory, a 1,400 square-foot space, aims to broaden students’ financial literacy, provide the next generation of financial managers with the knowledge and skills needed to succeed in the financial market and to build student understanding of the relationship between public policy and capital markets. The trading lab, on the fifth floor of the ASB, was the last phase of construction for the School, named after Millicent and Richard Anisfield, whose donation of over $5 million supported the school. The Board of Trustees at Ramapo College announced a $2 million gift to the College from Bergen County philanthropists Myron “Mike” and Elaine Adler of Franklin Lakes for establishment of the Adler Center for Nursing Excellence. The gift helped to fund the new home of Ramapo College’s highly-acclaimed and expanding nursing programs, as well as state-of-the-art labs to enhance the education of all science students. 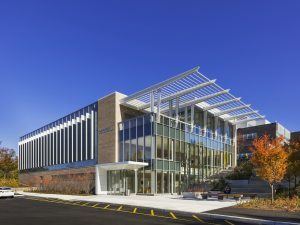 The gift was part of a $54 million renovation to the College’s G Wing, which houses the School of Theoretical and Applied Sciences and the School of Social Sciences and Human Services. The Adler gift helped to create a new two and one-half stories center, which connects to the existing building by an overhead walkway. For information about named gifts, please contact Cathleen Davey, Executive Director Foundation / Vice President Institutional Advancement at cdavey@ramapo.edu or call (201) 684-7615.